How many times have you accidentally included recipients from two different domains using that little dropdown in the To field of Outlook? Or worse, how many times have you seen messages go outside the domain of your company when people were told not do so? These actions not only waste time and money but in some cases jeopardize the company from a competitive angle. Or if you’re part of a law firm, it could mean legal action. Example warning when sending emails outside the company. The recipients that are outside the company domains are displayed in the prompt, ensuring accuracy by the sender. 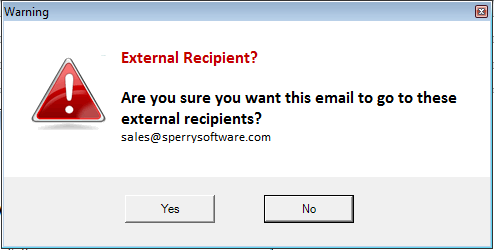 In the example above, an email addressed to someone at Sperry Software is shown. If the user clicks Yes to continue sending the outgoing email, other actions can take place for instance adding a BCC or changing the subject or body of the email on the fly. Start ensuring your user’s outgoing emails are accurate by downloading a free 14-day trial today! Corporate customers – Sperry Software offers significant volume discounts and custom builds for those firms interested in purchasing volume licenses. Do you need to prevent emails from going to large groups when you reply to all? If so, be sure to check out Reply To All Monitor Add-In for Outlook. It will prompt you when you are inadvertently replying to everyone, saving the company from a #ReplyAllpocalypse. Best of all, these add-ins can be packaged together to simplify deployment in corporate environments. "Just wanted to thank you for putting together some great time-saving add-ins!" Items in bold are new in this release. All of these features are individually controlled, so that you can just use one or the other independently. Note: These conditions are ANDed together (if they are in the same "rule"); you can have multiple rules to check multiple unrelated conditions. While there are server-side solutions available for some of these issues, it can only help to give yourself and your employees a chance to think about the message they're sending - before it wastes server time and bandwidth. Doing so helps you to minimize risk and it makes a great additional line of defense against the misuse of email by employees. Furthermore, because the add-in can scan attachments for your sensitive keywords before they get encrypted, you can know that there won't be any slips. You'll be amazed at how much time can be saved and how much the amount of "internal spam" will be reduced once you ask senders to just take a moment before hitting the Send button. Here you can see the available rule conditions and actions that the Safeguard Send add-in supports, along with two example warning prompts. The grid based warning prompt can disable the "Ok" button until all the checkboxes have been checked. Note that if the attachment being scanned is itself an email, that the scanning for keywords is recursive and any attachments on that email will subsequently be scanned. This feature was originally developed for the US Navy.